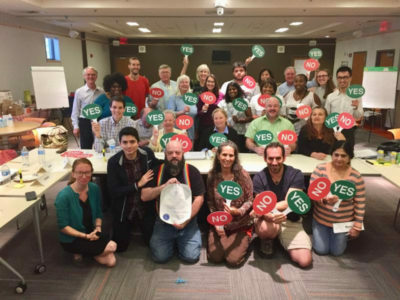 I’m pleased to tell you that the panel of Massachusetts voters convened by the Citizens’ Initiative Review project has released its Citizens’ Statement on Question 1, the ballot initiative on nurse staffing limits. It is available here. Citizens’ Initiative Review (CIR) is a non-partisan voter education effort in which a citizen panel representative of the state’s overall population conducts in-depth deliberations on ballot questions. The Citizens’ Statement does not make a “yes” or “no” recommendation but rather seeks to convey information the panelists think their fellow voters should know in deciding how to vote. It goes beyond the competing claims of the two campaigns to present facts and reasoning that a cross-section of ordinary voters considers important and reliable. And it presents them in a way that is concise and readable. The CIR on Question 1 was organized by my office in partnership with Tufts University’s Jonathan M. Tisch College of Civic Life and Healthy Democracy, the organization that pioneered CIR in Oregon and is helping to pilot it in Massachusetts, California and other states. It was held over four days earlier this month at the Watertown Public Library. The campaigns for and against Question 1 both appeared before the citizen panel three times to present their arguments and answer questions. The citizen panelists also heard from seven neutral experts in fields relevant to nursing, patient safety, and healthcare. Professional moderators facilitated the panel’s deliberations that produced the Citizens’ Statement. The 20-member CIR panel was drawn from respondents to a mailer sent to 15,000 randomly-selected Massachusetts voters. An objective methodology was used to ensure that the panel accurately reflects the state’s population in terms of age, gender, race, party affiliation, place of residence and educational attainment. This is the second time my office, Tisch College, and Healthy Democracy have organized a CIR in Massachusetts. In 2016, 77% of voters who saw the Citizens’ Statement on marijuana legalization said they found it helpful in deciding how to vote on that ballot question. On major factual issues, voters who read the Citizens’ Statement were better informed and more confident in their knowledge than those who only read the official voter guide. John Gastil, Professor of Communications at Penn State, will conduct surveys to determine how helpful the 2018 Citizens’ Statement proves for Massachusetts voters. This research will inform efforts to enact legislation I have filed to make CIR a regular part of our election system. I hope you find the Citizens’ Statement useful and will share it with others. If you have any questions or feedback, please let me know.